The genomes of most higher organisms contain sequences from retroviral genomes called endogenous retroviruses (ERVs). These are DNA copies of retroviral RNAs that are integrated into the germ line DNA of the host, and passed from parent to offspring. In most species the infections that lead to germ line ERVs appear to have occurred millions of years ago. The Koala retrovirus, KoRV, is the only retrovirus that we know of that is currently invading the germ line of its host species. A study of Koala pelts preserved in museums suggests how recently the virus infected this animal. The koala is native to Australia, and all koalas in northern Australia are infected with KoRV. However not all animals in the southeast or on southern islands are infected. It is believed that KoRV crossed into koalas from another species (possibly the Asian mouse Mus caroli) some time within the past two hundred years. To test this hypothesis, DNA was extracted from 28 koala skins that were held in museums and which had been collected from the late 1800s to the 1980s. 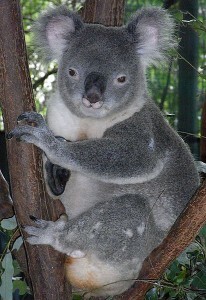 Polymerase chain reaction was used to detect KoRV DNA in the koala genome. The results show that KoRV was already widespread in Northern Australian koalas by the late 1800s. It has since spread slowly because the virus is not ubiquitous in southern koalas. The slow dispersal may due to the sedentary and solitary nature of koalas. Examination of mitochondrial DNA from the koala skins confirmed that there has been limited movement of the animals with Australia. The sequence of the KoRV gene encoding the viral glycoprotein, env, was also determined. The results reveal that env sequences from museum specimens are remarkably similar to those of KoRV found in contemporary koalas. At first glance this result might not seem surprising: the endogenous KoRV genomes are evolving at the same slow rate as the host DNA into which they are integrated. However, there appear to have been multiple transmissions and germ line invasions by KoRV, leading the authors to suggest that in all cases very similar retroviruses were involved. Infection with KoRV in captive animals is believed to cause immunosuppression, leading to fatal lymphomas or Chlamydia infection. A Chlamydia epidemic is believed to have killed many koalas in 1887-1889, consistent with the PCR results indicating that KoRV was widely present at that time. What would be even better would be to have access to fossilised material that predates European settlement, that we could examine. We collaborated with an “Ancient DNA” specialist and tried this several years ago but we weren’t able to recover usable template DNA. Still worth some future effort though. Avila-Arcos MC et al (2012). 120 years of koala retrovirus evolution determined from museum skins. Mol Biol Evol. 2012 Sep 14.